This evening I attended a cooking event at Central Market that was focused on food writers and bloggers in the Austin area. It was such a great chance to meet up with fellow bloggers, taste amazing local foods and wines, have access to great cookbooks, and enjoy the talent of the Central Market cooking school staff. 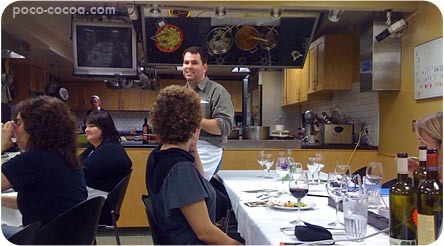 Chef Vance Ely led the class, sharing anecdotes and recommendations for local foods. 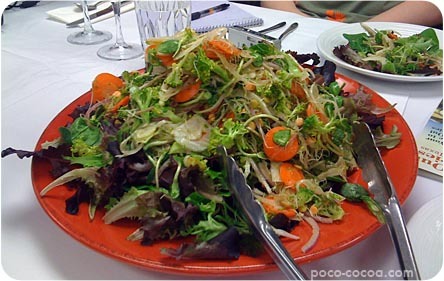 We started with a beautiful salad with greens, “super sprout salad” (made from sprouted red and green lentils, chickpeas, sunflower seeds, and alfalfa), broccoli, carrots, and fennel, tossed with Texas Sassy vinaigrette. 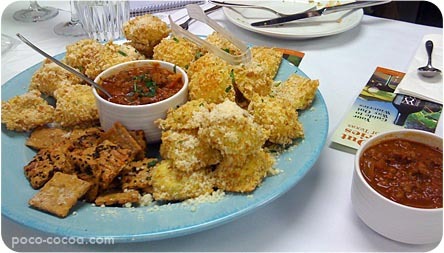 Next up was a platter of toasted ravioli, handmade and filled with local cheese, then dredged in breadcrumbs and pan-fried. These were served with Austin Slow Burn marinara pumped up with Thunderheart ground bison and local venison, as well as a few Dr. Kracker bites for good measure. The ravioli was insanely good. 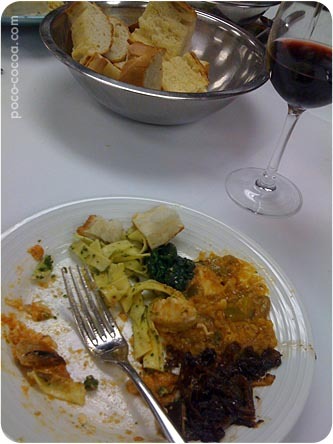 The main event was a plate full of goodness… eggplant Parmesan, chicken cacciatore, caramelized onions, sauteed spinach, and handmade pasta tossed with Hairston Creek Farm’s spinach pesto, with toasted buttered bread on the side. I couldn’t believe how simple yet amazingly flavorful the sauteed spinach was, and the eggplant Parmesan was incredible. Dessert was Chef Vance’s own Meyer lemon and honey frozen custard, a sweet-salty-creamy-eggy treat that I didn’t manage to photograph. Among the attendees were Jenna from Edible Austin, Addie from the Statesman, Jam from Thai Fresh, James from James Eats, Girlie and Husbear from Boots in the Oven, Beth from Texas Locavore, Amy from Austin Tidbits, and Jodie from Food Touring. We were also able to chat with winemakers from Flat Creek and Alamosa wineries (who kept our wine glasses full) as well as cookbook author Martha Hopkins (who sent us home with two great cookbooks). I’m excited about the possibility of live podcasts of Central Market cooking classes, about going out to Flat Creek Vineyard to watch them bottle their new white wines, about future meet-ups with these like-minded eaters/writers. Blogging, Facebook, and Twitter have really introduced me to a great group of food lovers! So much fun last night! I’m glad I got to sit by you. I hope you’re feeling better soooooooon. Damn allergies. When do we put aside the war on drugs and make it the war on allergens? Sounds like you all had quite a time! We would love to include you on our media list and send you info on the latest restaurant happenings around town. Check out our website at http://www.paulabiehler.com and please email me.